Description: Named for the Greek word for light, Ilona will stir conversations among family and friends with a dramatic Honey and Beige colored knotwork design on Wispy Blue/Green Rippled glass. 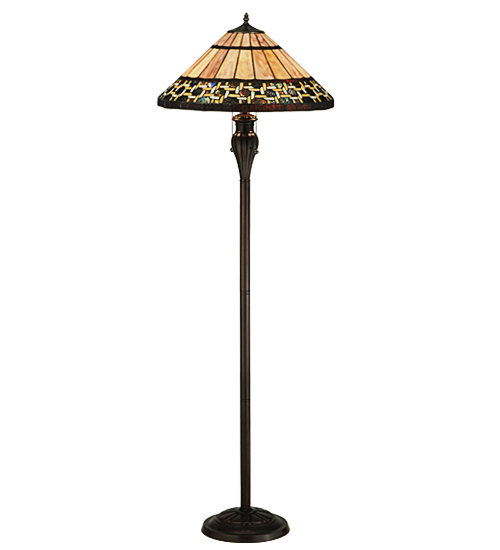 The lamp shade's background includes Beige, Mauve and Purple art glass while Root Beer colored glass borders enhance the beauty of this exquisite art glass shade, which is created using Meyda Tiffany's famous copperfoil construction process. The floor base is finished in a warm Mahogany Bronze.